MessyJesse - a quilt blog by Jessie Fincham: DaWanda Featured Seller: O Christmas Tree! DaWanda Featured Seller: O Christmas Tree! Is it too early to start looking for Christmas presents or decorations!? well.. i don't think so :) it always seems to come around in the blink of an eye, and leave me completely unorganised! So here's my first instalment of Christmas shopping ideas! Aren't these THE best wreath's you have ever seen! I have fallen in LOVE with them and need one in my own (imaginary) home this year :) They are handmade in Cincinnati, USA. O Christmas Tree also has some other lovely festive decorations all at very reasonable prices. I'm sure they will bring some christmasy cheer to any home! Oh, I am the same way. Already bursting with excitement over Christmas & New Years. 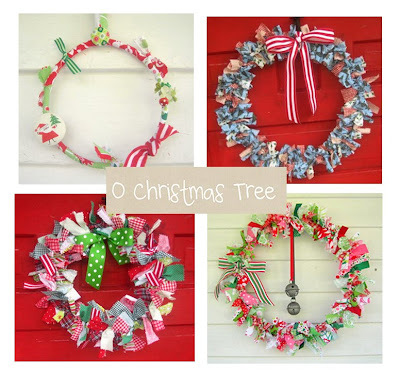 These wreaths are seriously cute. Gorgeous! I had a look on the site and I'm loving them - they make a real change to the usual boring wreaths outside the greengrocers!